It’s been a long anyone one called me for breakfast. Living in a metropolitan city it is hard to find time for breakfast with friends. I always miss the breakfast with my family. Because of my career needs me staying away from my family. Every day new dish on breakfast, every day new taste, every day new love. When Kellogg’s Waale Guptaji called for breakfast I was so happy. Their way of preparing breakfast in no time. Following are the recipes I liked very much. 1. Heat the oil in a pan, add the mustard seeds and cumin seeds, let the seds crackle. 2. Add the green chillies, curry leaves, asafetida, turmeric powder and sauté on a slow flame for a few seconds. 3. 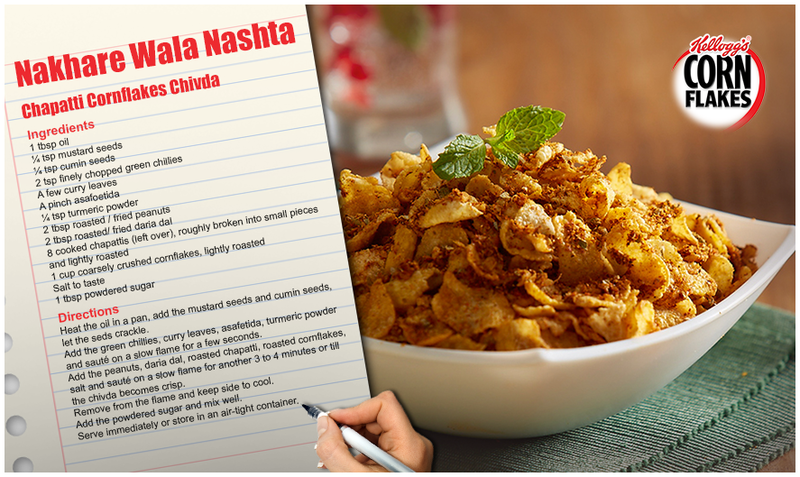 Add the peanuts, daria dal, roasted chapatti, roasted cornflakes, salt and sauté on a slow flame for another 3 to 4 minutes or till the chivda becomes crisp. 4. Remove from the flame and keep side to cool. 5. Add the powdered sugar and mix well. 6. Serve immediately or store in an air-tight container. Wow this one I like t have every day and my favourite one. 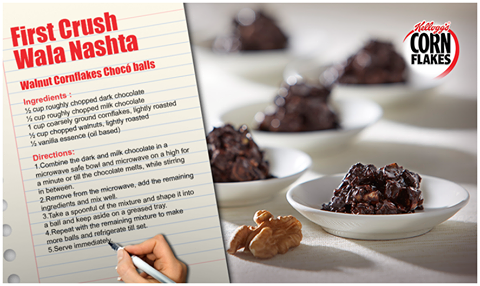 When I gone through this recipe it reminded me my old school days where I used to have as evening snack, while watching movie on DD national channel, miss my good old days. 1. Combine the dark and milk chocolate in a microwave safe bowl and microwave on a high for a minute or till the chocolate melts, while stirring in between. 2. Remove from the microwave, add the remaining ingredients and mix well. 3. Take a spoonful of the mixture and shape it into a ball and keep aside on a greased tray. 4. Repeat with the remaining mixture to make more balls and refrigerate till set. Wow! This took me to think of the first crush I had in my life. I was in live the girl she is my senior, 2nd day of my 4th std., examination. Her seat allocated next to mine. It was math and I was finding it difficult she took my paper and wrote few answers such a beautiful thing happened. After that every day I tried to see her, waiting for her arrival. Wanted to tell her that I like her so much. Exams over and she graduated to high school. Wish I had this First Crush Wala Nashta and could have shared my feelings.